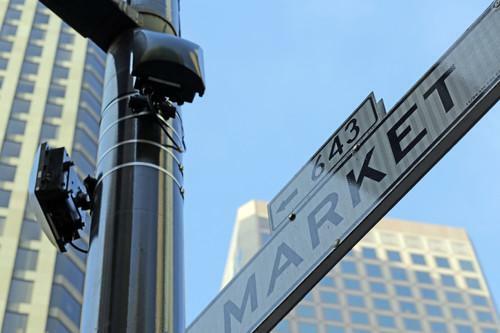 San Francisco activated outdoor Wi-Fi access points for a free network along Market Street on Monday. Verizon said Tuesday that it plans to spend $4.4 billion to buy AOL, which was once a leader in Internet connectivity but has struggled to find its way as a content provider and online advertising platform. AOL still has a subscription business -- anecdotally, aged users who don't know they can get e-mail for free from Yahoo and Google -- and also owns The Huffington Post, TechCrunch, Engadget and other media brands. Wireless hotspots that can deliver hundreds of megabits per second in real-world bandwidth should soon be easier to find as operators upgrade to 802.11ac, the fastest Wi-Fi technology yet, according to a survey by IHS. By this time next year, a noticeable number of hotspots will use it, says the research firm, which expects operator spending on Wi-Fi networks to increase by 88 percent in 2015. A critical vulnerability in the MacKeeper security package could let attackers execute malicious commands on Macs when their owners visit specially crafted Web pages. The developers acknowledged the flaw and have released a fix, instructing users to install version 3.4.1 or later. This isn't the first time MacKeeper has attracted attention for the wrong reasons: Its previous owner, Ukraine-based ZeoBIT, was accused in a class-action lawsuit of warning users about fake security and performance problems to get them to pay up for the full version of the product. Mobile carrier AT&T is stamping its name on its first tablet, the Trek HD, which will be available from Tuesday for just under $50 with a two-year contract. The device has an 8-inch screen, runs Android 5.0 and a Qualcomm Snapdragon 400 processor that has an integrated LTE modem. Princeton computer science professor Edward Felten, who has been digging into security issues for decades (and way before it was cool) is joining the White House Office of Science and Technology Policy as deputy U.S. chief technology officer, the Washington Post reports. Among the more interesting work Felten has done is delving into the poor security of electronic voting machines. Two veterans of Google and Yahoo have launched a startup and new cloud platform -- both called Mode -- that aim to serve developers of Internet-of-things applications. The platform provides a cloud API for devices, mobile clients and application servers, offering IoT developers a back-end infrastructure that's designed to span the entire development cycle, from prototyping to product launch. Add Senator Mark Warner to the list of people who seem mildly creeped out by the exploding popularity of drones. The Virginia Democrat and member of the Senate Intelligence Committee on Monday asked that the U.S. Department of Transportation research technologies to combat "rogue" drone flights and develop counter-drone technologies to defend sensitive airspaces. Google has taken Map Maker offline after the tool, which lets people add edits and information to Google Maps, was used to add offensive or spammy edits. It's suspending user edits until it can find "ways to add more intelligent mechanisms to prevent such incidents," PC World reports. Can't the Internet just grow up? This is why we can't have nice things, like crowdsourcing. Everyone likes a good review -- unless it turns the spotlight on illegal activity. An apparently stellar AirBnB host in Amsterdam was illegally renting out his home on the site, and is now being evicted after glowing online reviews helped prove how long he'd been making money by "sharing" the housing meant for low-income tenants. Google says its self-driving cars will improve safety because they pay better attention to the road than humans do, but there have been a few dings along the way. Google's cars have been involved in 11 accidents in the six years the company has been testing them, the director of the self-driving car program reported on Monday. The fleet of 20-plus cars has covered 1.7 million miles of autonomous and manual driving in that time. Microsoft, like Google before it, is building its own worldwide network of fiber. Over the last nine months the company has bought up terrestrial dark fiber and undersea links, it revealed Monday. Take a close-up look at the killer camera controls in LG's G4 flagship Android phone. Quantum computing won't just enable better weather forecasting, financial analysis, space exploration, and drug discovery. The huge leap in processing power and speed enabled by quantum computers will make modern cryptography trivial to break, says the Washington Post, and that has huge implications for security.